Suppose someone were to ask you what was north of the North Pole. You might explain that the question is a bit nonsensical. The North Pole is a point on the Earth defined by our planet’s axis of rotation. 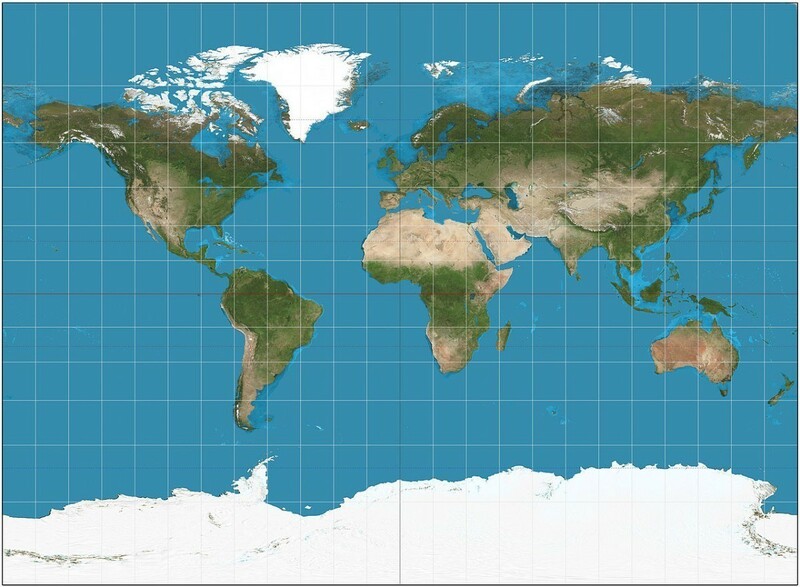 The Earth is actually round, and all lines pointing north eventually converge at the North Pole. There isn’t actually anything north of the North Pole. There’s a similar question often asked of astrophysicists: what happened before the big bang? Implicit in the question is that asking about “before” the big bang is like asking about “before” yesterday. In our everyday lives there is alway a before, just as in our everyday lives we can always take a step north. But the big bang is the limit of how far back in time we can observe, just as the north pole is as far north as we can go. 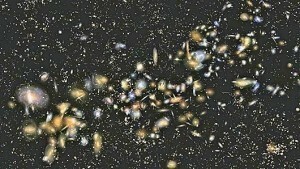 There is a common view that the big bang occurred at a point. While it is true that the observable universe was once small enough to fit in the palm of your hands, this isn’t a particularly good view of the big bang, because the big bang didn’t begin at a point, it began everywhere. You can get an idea of this in the figure. Because of the finite speed of light, as we look at more distant objects we also look into the past. So the light of nearby galaxies is millions of years of years old, that of more distant galaxies is billions. Beyond the farthest galaxy is the cosmic microwave background, which is the thermal remnant of the big bang. Beyond that, in every direction you could possibly look, lies the big bang. Of course we can’t see beyond the cosmic microwave background, because the early universe was so hot and dense that it wasn’t transparent. Despite our inability to directly observe beyond the cosmic microwave background, we do know quite a bit about the time before it. We know, for example, the temperature at which atoms began to form. We know that there was an early inflationary period. And we know the universe did not begin as a singularity. The observable universe was once small, but it did not begin as a point of zero volume. In fact, because of inflation it is possible that the universe did not begin at a single point in time. We also know to the limits of our observations that the universe has no overall curvature. That means the universe must be much larger than the region we can observe. As best we can tell, the universe is infinite in size. If the universe is infinite in size and has no clear first moment in time, then what happened before the big bang? What lies beyond infinity? What is north of the North Pole? So let’s rephrase the question. Why did the Universe “Bang” 13.8 billion years ago? Not 10 trillion years ago? What was ‘it’ waiting for? A ‘Trigger’? In a Time-less, Spaceless Void? Was the Universal Clock reset at this point? Before Inflation, the Universe was very hot, small and dense (by our reckoning from within). Are there dimensions of space and time where & when this hot, tiny dense Universe started to Inflate, forever out of reach of our knowing? What tipped it into Inflating when it did? Just as on Earth, there is nothing north of the North Pole, in space, without any reference to the Earth, there is No North, or South anywhere? My feeble grasp of the Big Bang needs a frame of reference. Your example of the North Pole left me wondering. On Earth’s surface, we can travel to the exact spot of the North Pole. Theoretically, we can drill straight down and/or fly straight up, travelling along the axis of the North Pole. To do so, we have to travel along a line, which is perpendicular to North, East, West and South that are clearly defined on the Surface of the Earth. “Perpendicular to all known axes of dimensions we know” on the surface of the Earth. (sound familiar?) Yet, we can clearly travel along a Line that intersects the surface of the Earth at the North Pole and travel up or down for miles along a dimension called “Altititude”, with the North Pole as our starting point, without straying from True North. Is there any analog to this on the Cosmic Scale? Curious. In this analogy the Earth would be all that exists. Given that the universe is all that exists, it would seem to be an apt analogy. I’d like to know how you can conclude with such arrogant certainty that “the universe is all that exists”. Akin to how a person who has been raised in complete confinement could not comprehend or imagine an existence beyond the limitations of his own personal observable input, and thus would presume that his “cell” is all that exists. Boy, would he be wrong. Try reading Room, by Emma Donahue, for some perspective on this concept, and apply it to your narrow view and contemplation of the potential of spacetime. Fact of the matter is that the big bang as the conclusive solution to the fundamental question of creation and existence is a violation of the first law of dynamics, conservation of energy, which states that energy cannot be created nor destroyed. That infinitesimally small and dense point, and the trigger that set it into motion, could not have simply “been”. Inadequate theory. Period. Actually the term Universe defines all that exists. It isn’t a conclusion you have to draw. The idea that what we observe may not be all there is goes back farther than Plato’s cave allegory. It’s not a new or radical idea. You have to be careful when applying thermodynamics to cosmology. The big bang doesn’t violate physics, and you can’t simply use thermodynamics to rule it out. To find out the north of the north pole,according to my ASSUMPTION,consider earth as a big bar magnet.In a bar magnet,the magnetism is from south to north through the surface and north to south through the inside of it.Just consider that there kept a magnetic compass in air in north pole,then according to the proven statements,it must face down vertically as the flow is from north to south through inside of it.And I can conclude that by the ‘right hand thumb rule’,the earth rotates west to east,so earth is more like a bar magnet or an geoidical magnet of same property, which is the main reason of my assumption. It’s some problem a whole generation of people have been “brainwashed” with the idea that the big bang meant: absolute beginning of time, space and matter (so people can still drop in their favourite ‘creator’), while already from the 80-ies models were developed that showed that before the hot big bang phase there was in fact a cool phase with fast expansion of space. They could not be tested at that time, but graviational waves were already predicted in 1979. IMO, when you’re at the North Pole, North is straight up, and South — if I have to convert it to a single direction in XYZ space — is straight down. Vice-versa at the South Pole. (Yes, this creates a discontinuity, but that’s unavoidable anyway by the Hairy Ball Theorem.) How does that fit into your model?